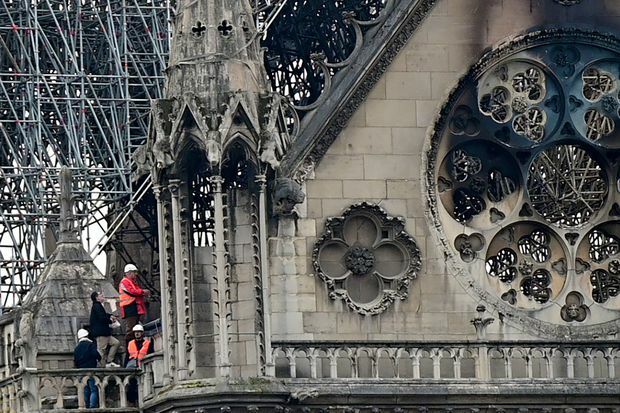 Notre-Dame's cathedral spire shown intact on Dec. 9, 2018, left; as it was collapsing during a fire on April 15, 2019, middle; and in the aftermath of the fire on April 16, right. Investigators in Paris think the fire that consumed Notre-Dame Cathedral’s roof and spire on Monday was likely caused by an electrical short circuit, a police official said Thursday, speaking with Associated Press on condition of anonymity. In the timeline of events pieced together so far, firefighters, priests and municipal workers had only 66 minutes to save what they could after the first alarm sounded at 6:20 p.m. on Monday. Without firefighters’ quick action, a “chain-reaction collapse” could have brought the entire building down, a French Culture Ministry official said. France held a day-long tribute to the firefighters, hundreds of whom gathered at the Elysée Palace in Paris to be feted by French President Emmanuel Macron. Since Monday’s fire destroyed the cathedral’s wooden roof and spire, nearly $1-billion has poured in from corporate donors and ordinary worshippers around the world. Contributors include Apple, the magnates who own L’Oreal, Chanel and Dior, and Quebec-based gaming company Ubisoft, which meticulously documented the cathedral for it’s video game Assassin’s Creed Unity. is one of the defining landmarks of Paris. When fire first erupted in the 850-year-old catheral, which is undergoing renovations, the first warning was a fire alarm at 6:20 p.m. For 23 minutes, it seemed like a false alarm, and no one could find a fire. Then, at 6:43, a second smoke detector went off and the fire became visible in the ancient wooden roof. The cause is not yet known, but investigators so far believe it was accidental. The fire swiftly ripped through Notre-Dame’s timbered roof supports, where workmen had been carrying out extensive renovations to collapsed balustrades and crumbling gargoyles, as well as the spire’s wooden frame. By 7:49 p.m., the burning spire toppled as horrified onlookers watched from along the Seine. It took firefighters nearly 14 hours battling through the night before they declared the fire extinguished. We are used to thinking about them as eternal simply because they have been there for centuries, or a thousand years, but the reality is they are very fragile. The most extensive damage is to the wooden roof and spire, which collapsed. But its bell towers and the stone edifice itself were saved. Repair crews’ first priority was to put up a temporary metal or plastic roof to stop rain from getting in. Then, engineers and architects will begin to assess the damage. 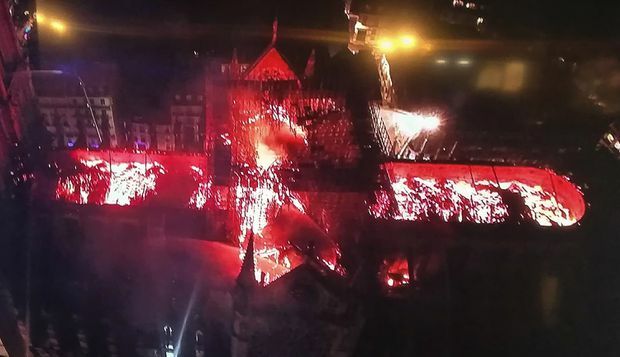 An aerial view of the Notre-Dame Cathedral engulfed in flames on Monday. Religious statues that were removed last week from the cathedral roof were also spared. The three-metre-tall copper figures, which looked over the city from Notre-Dame’s 96-metre-high peak, were sent to southwestern France for work that is part of the renovations. April 11: A statue of Saint John is removed from the spire of Notre-Dame cathedral by a crane before restoration work. The organ is a very fragile instrument, especially its pipes. It has not burnt, but no one can tell whether it has been damaged by water. Nobody knows if it is a functioning state or will need to be restored. 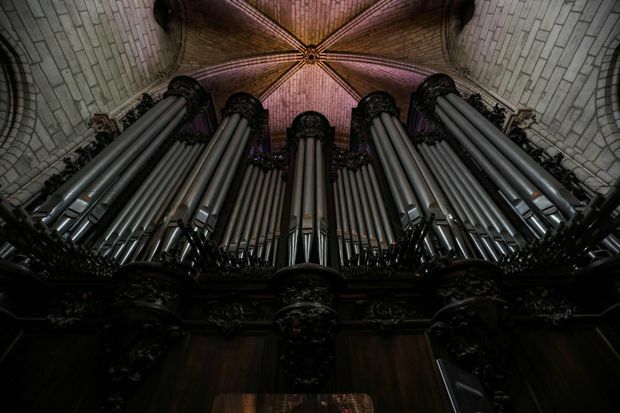 Notre-Dame's organ, as seen on June 26, 2018. A centuries-old crown of thorns made from reeds and gold, and the tunic believed to have been worn by Saint Louis, a 13th century king of France, were saved, according to Monsignor Patrick Chauvet, Notre-Dame’s top administrative cleric. The Holy Crown of Thorns is displayed during a ceremony at Notre-Dame Cathedral in 2014. Notre-Dame de Paris, or Our Lady of Paris, is a marvel of medieval and modern ingenuity that has come to be one of France and Europe's defining symbols. Construction was begun in 1163, and its two massive towers were finished around 1245, but the building was not completed until the beginning of the 14th century. In the wake of the French Revolution, the cathedral was declared a “Temple of Reason” as part of an anticlerical movement. All of the original bells were destroyed, except for one. For decades, the aging cathedral kept falling into disrepair until the 1830s, when Victor Hugo’s novel Notre-Dame de Paris – known to English-speaking audiences as The Hunchback of Notre-Dame – rekindled interest in the building and led to major renovations. It was in the 19th century that the huge central spire was added. Today, Notre-Dame is one of Paris’s biggest tourist attractions. It is owned by the state and has been at the center of a years-long row between the nation and the Paris archdiocese over who should bear the brunt of costs for badly needed restoration work. In an impromptu act of togetherness and hope, Parisians and visitors to France’s charismatic capital came together to pray and sing for Notre-Dame as the fire quickly advanced through the cathedral Monday. In front of the Saint-Julien-des-Pauvres church, voices joined an unceasing communal hymn sung mostly a cappella, though accompanied at one point by two violins. I think this building just symbolizes Paris, no matter if you’re Catholic or not. I’m not. I’m just here because I couldn’t stay at my place just knowing that this thing is happening and there are people gathering, singing this religious anthem. I tell you solemnly tonight: This cathedral, we will rebuild it, all together. Without a doubt it is a part of our French destiny. Religious and political leaders around the world mourned in solidarity with France and offered assistance in rebuilding. Others shared pictures on social media of their visits to the cathedral, expressing sorrow that others would never see it the way they did. As we watch this tragic fire engulf Notre Dame, we’re saddened by the damage to this beautiful Cathedral. But during Holy Week, we are reminded of Christ's love for humanity that knows no bounds. My thoughts are with all Parisians and Catholics around the world today. Cost: It is too early to estimate the cost of the damage, Mr. de Feydeau of the Fondation du Patrimoine said Tuesday. But it is likely to run into the hundreds of millions of dollars. Major European insurers told Reuters they expect France will pick up most of the tab. But two of France’s richest men, who are open rivals of one another – Francois-Henri Pinault, chief executive of the Kering group which owns brands including Gucci and Yves Saint Laurent, and Bernard Arnault, the main shareholder of luxury group LVMH – offered to donate €100-million and €200-million, respectively. Apple and the owners of cosmetics giant L’Oréal also pledged large sums. Materials: Regardless of expense, some of the destroyed parts of the cathedral are irreplaceable, some heritage experts cautioned. Mr. de Feydeau said the cathedral’s roof cannot be rebuilt exactly as it was before because “we don’t, at the moment, have trees on our territory of the size that were cut in the 13th century.” He said the restoration work will have to use new technologies to rebuild the roof. Inspectors are seen on the roof of Notre-Dame the day after the fire.